JoyEtech Atopack Magic Replacement Cartridge - SingleThe Replacement Cartridge, for the ATOPACK Magi..
JoyEtech ATOPACK Magic Pod KitIntroducing the new member of the ATOPACK series from JoyEtech, t..
JoyEtech RunAbout 5pk CartridgesThese replacement cartridges are for the RunAbout Pod System Kit by ..
JoyEtech RunAbout Pod KitIntroducing the RunAbout Pod System, the perfect combination of fashion and..
JoyEtech Exceed Edge 5pk Pods (For Pod Edition Kit)Refillable pods for the Exceed Edge Pod Edition K..
JoyEtech Exceed Edge (Pod Edition) KitThe new Exceed Edge Pod Edition Kit from JoyEtech is ergonomic..
JoyEtech eGo AIO ECO 5pk Replacment GlassReplacement Glass for the eGo AIO ECO Kit from JoyEtech. Av..
JoyEtech NotchCoil 0.45 Ohm 5pk for Espion Silk KITThe package comes with five 0.45 ohm coil heads. ..
JoyEtech TEROS 5pk Replacement CartridgesThe TEROS all-in-one pod system by JoyEtech utilizes a conv..
JoyEtech TEROS Pod KitC O L O R C H A N G I N G T E C H N O L O G YPresentin..
JoyEtech RiftCore DUOREVOLUTIONARY NO COIL SYSTEMGet rid of the tedious rebuilding process by using ..
JoyEtech BatPack Kit with Joye ECO D16 and AA/NiMH Batteries INCLUDED(BatPack mod is only to be used..
JoyEtech Exceed Edge 5pk Cartridge (For Coil Edition Kit)Refillable cartrodges for the Exceed Edge C..
JoyEtech EX 1.2 ohm 5pk CoilsThe JoyEtech EX 1.2 ohm mouth-to-lung head (Rated: 8-14W / Best: 12W) i..
JoyEtech Exceed Edge (Coil Edition) KitBeing a pod system while you can still change the coil heads ..
JoyEtech eGo AIO ECO 5pk CoilsThe newly added BFHN 0.5ohm coil head is now optimized for use with hi..
JoyEtech eGo AIO ECO KitStylish and discrete the eGo AIO ECO is a great all-in-one stealth e-cig not..
JoyEtech Espion MODBeing a strong sense of business style, the Joyetech new ESPION PROCORE X becomes..
JoyEtech Espion with ProCore X KitThe pace of innovation never ceases. 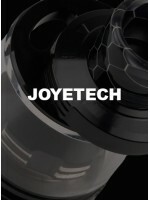 Being a strong sense of busin..
JoyEtech EKEE Kit with ProCore Motor AtomizerInspired by the automobile smart key, the JoyEtech EKEE..
JoyEtech EVIC PRIMO SEHaving a large 0.96 inch OLED display and a new easy-to-go interface, the eVic..
JoyEtech Atopack JVIC 5pk CoilsThe innovative JoyEtech JVIC (Juice Vertical Injection Coil) system a..
JoyEtech Atopack Penguin 8.8mL CartridgeThe JoyEtech ATOPACK Cartridge forms a refillable structure ..
JoyEtech Cuboid TAP 228W ModInnovation never stops. Introducing the much anticipated Cuboid Tap MOD ..
JoyEtech eGo AIO KitJoyEtech eGo AIO, being all-in-one style, attaches the best anti-leaking structu..
JoyEtech MGS 5 Pack Coils for Ornate TankThe new MGS series heads, including MGS SS316L and MGS Trip..
JoyEtech MG 5 Pack CoilsThe new MG series heads, including the MG Ceramic 0.5 ohm head, MG Clapton 0..